Beverly Hills, California, April 20, 2015 – The Reverend Prebendary Rose Hudson-Wilkin, Chaplain to Her Majesty, Queen Elizabeth II, will visit Los Angeles in July 2015. 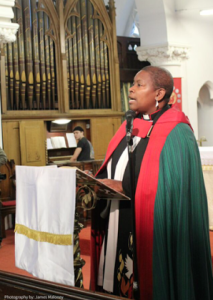 Also holding the historic title as the 79th Chaplain to the Speaker of the House of Commons, Reverend Hudson-Wilkin is the first woman, and the first person of color to serve in this capacity. While in Los Angeles, the Reverend Hudson-Wilkin will be honored by Jamaica Cultural Alliance (JCA) with the JCA Trailblazer Award, which is given for setting high standards while charting distinguished courses for those of Caribbean Culture and History. She will also participate in the closing ceremonies of the 2015 Special Olympic World Games, being held August 2, 2015, at the historical Los Angeles Memorial Coliseum. In 2007, Reverend Hudson-Wilkin was appointed as Chaplain to Her Majesty the Queen of England, making her one of the few who are invited to officiate, at the 400 year old Queen’s chapel at St James Palace. In 2010 she was appointed to the role of Chaplain to The Speaker of the House of Commons \ by The Rt. Honorable John Bercow MP, and combines this role with the position of being the Parish priest of a church in the City of London; A Chaplain to Her Majesty & being a Priest Vicar of Westminster Abbey. “When you are the first person in a particular role then you are looked to as a pioneer. For pioneers, there is no easy task. You are blazing a trail, you are making a path clear for others like yourself to follow,” she says. “And there will be, many obstacles in that path,” as the Reverend Hudson-Wilkin stated quite clearly. Reverend Hudson-Wilkin was born and raised in Montego Bay, Jamaica. “It is only befitting that we bestow upon her the JCA Trailblazer Award recognizing her numerous accomplishments, and we are proud to do so” states Dorothy McLeod, founder and Executive Director of the Jamaica Cultural Alliance. Jamaica Cultural Alliance (JCA) is a Los Angeles based non-profit organization with the objective of expanding and enriching American knowledge and awareness of Jamaican culture, history and heritage. Parliament in London is an old­ fashioned place. When members gather in the House of Commons, the sea of faces is generally wrinkled, white and male.